As we started to pull out of Union Station last night, the train stopped and the conductor announced that we would be holding for folks from the Coast Starlight. This is exactly why we came down on that train a day early; we didn’t want to have to deal with a tight connection like that. Today (Saturday) we discovered that things were worse than we thought; it seems that the Starlight was so late that folks coming from Oregon were switched to another train in Sacramento that took them to Bakersfield, and then they were put on a bus to LA’s Union Station. However, those folks weren’t the reason that the Sunset Limited (today’s train; it runs from LA to New Orleans) was being held. There was another couple who was supposed to get onto the Coast Starlight in San Jose, but they wouldn’t have made the connection so they were put straight on a bus that took them to Santa Barbara, at which point they were put on one of the coastal trains that brought them to LA. Getting back to our schedule, however, as we pulled away from the Tucson station I was thinking that a 40 minute delay wasn’t too bad; they could make that up. But then, just a few train-lengths from the depot, we stopped. A few moments later the conductor came onto the PA to announce that there was a private rail car attached to the end of our train, and that we were going to take a few minutes to disconnect it (their destination was Tucson). Well, “a few minutes” became something more like half an hour. Finally, the task was done. Could we go now? Sure…once the dispatcher gave us clearance to leave the side track where we had deposited the private car and rejoin the main line. So we sat for another five minutes or so, after which we saw a freight train roll slowly past us on the main line, going our way. Yep, we were now going to have to follow behind this slow freight, which meant that not only wouldn’t we make up time, we’d continue to fall further behind. And then…the train stopped and we heard from the conductor once again. It seems that there was a signal problem up ahead and we couldn’t proceed until the dispatcher determined that it was safe. Sheesh. We finally got going for real, and got to our next stop–Benson, AZ–about three hours behind schedule. After a quick stop in Benson (as you can see from the picture, there isn’t even a station), we hit the rails once again and almost made it to Lordsburg (New Mexico) without stopping. Unfortunately, we got within sight of the town when we had to stop and wait for another train (a freight, presumably) to clear the area. As I sit in our compartment writing this, we are still waiting to be able to pull into the Lordsburg station. Having written all of the above, delays like this aren’t really a big deal if you plan ahead, as we did. We intentionally took the day-earlier Coast Starlight just in case what actually did happen happened. Although our Starlight came into LA early, if it had been a couple of hours late we still would have been fine, and wouldn’t have had to switch to a bus and miss some of the rail segments as others who gambled on the tight connection actually did. And while we may yet make up some of this delay before we get to Houston, we have plenty of time there and so the loss of a couple of hours won’t affect our trip all that much. As it was, we had a delightful lunch today, sitting with a couple from Salem, Oregon who were among those who had to ride a bus from Sacramento to LA. They were a bit disappointed at having missed the coastal segment of the Coast Starlight, but they understood “Amtrak time” and were enjoying themselves anyway. They’ll be getting off in El Paso–a couple of hours from now–and will reverse the journey on the way home, so they hope to see the Santa Barbara coastline then. We finally made it into Lordsburg. We were scheduled to pull out at 12:15pm. As the whistle blows signaling our imminent departure, my clock shows 3:55pm. So we are now running three hours forty minutes late. 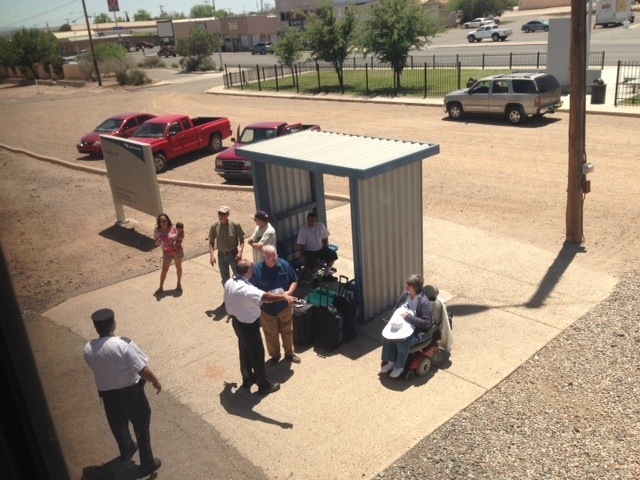 Oh–and if you thought the Benson “depot” was small, you should see Lordsburg! They don’t even have a little shelter. Just a sign in the gravel beside the tracks. This entry was posted in An Amtrak Grand Tour on April 27, 2013 by Greg Wilson.